Can Invisalign from Your Newburyport Dentist Work for You? What prevents you from getting your teeth straightened? Do you think you are old for metal braces? Are your personal and professional schedules too crowded? Aren’t all braces just plain ugly? Think again! Invisalign clear aligners in Newburyport change crooked teeth into healthier, well-aligned smiles for older teens and adults of all ages and walks of life. Their look is amazingly discreet and the inconvenience, minimal. Learn about this innovative orthodontic system available from Drs. St. Clair, Beliveau and Strauss, dentists in Newburyport. 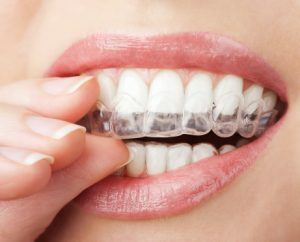 Invisalign is a state of the art orthodontic system which uses customized clear acrylic aligners, instead of traditional metal brackets and wires. They treat mild to moderate orthodontic problems. Used by millions of older teens and adults across the globe, Invisalign’s BPA-free appliances look like professional teeth whitening trays. But, really, no one but you and your dentists in Newburyport need know you wear them. In general, orthodontic patients dislike the restrictions metal and ceramic braces impose on their lives. For instance, people with traditional braces go through complex at-home hygiene routines and time-consuming adjustments at the dentist’s office. Conversely, Invisalign patients remove their aligners to clean them and to brush teeth and floss. They check in at Dental Partners of Newburyport every four to six weeks for progress checks and to receive the next pairs of aligners (there are 18 to 30 pairs in all depending on the case). Also, there are no dietary restrictions with Invisalign. Teens and adults enjoy their healthy food choices. There are no wires to break or brackets to dislodge with hard or sticky foods. Patients remove their appliances to eat and then replace them afterwards. For special occasions such as a wedding, job interview or graduation, people may elect to remove their appliances. Additionally, comfort is a benefit of Invisalign. With no wires or brackets to create sore spots or abrasions inside the mouth, Invisalign treatment is a smooth path to a new smile. As with any kind of braces, the dentists in Newburyport recommend patients wear retainers after treatment is complete. A custom-made Vivera retainer by Invisalign is the recommended follow-up appliance. Through oral examination and diagnostic imaging, your dentist can help you determine if Invisalign clear aligners are right for you. Contact Dental Partners of Newburyport arrange a smile analysis. Enjoy the health and aesthetic enefits a straight smile brings. Comments Off on Can Invisalign from Your Newburyport Dentist Work for You?